The Grenfell tragedy has put the design of rainscreen cladding systems into the forefront of all designers and clients minds, with A1, A2 and B ratings becoming a starting question asked by specifiers. So what are the implications for manufacturers and designers and how are these classifications obtained for rainscreen panels. EN 13501 is the certification which all construction products should be classified to. In order to obtain this classification the product needs to have been tested by a certified independent laboratory to EN 13823. This Single Burning Item test has the product arranged as a corner and a fire is applied to its face by a gas burner. The results of the EN 13823 test confirm the Fire Growth Index Rate (FIGRA), Lateral Flame Spread (LFS) and Total Heat Release (THR600s). Additional classification parameters are defined for Smoke Growth Rate Index (SMOGRA), Total Smoke Production (TSP600s) and for flaming droplets/particles. Further to the SBI test to classify a product as being of non/limited combustibility (A1/A2 rating) each individual component or layer must be tested to either EN 1716 or EN 1182. EN 1182 confirms that products are non-combustible by a specimen being ground and burnt. EN 1716 determines the potential maximum total heat release of a product when burned completely by calculating the Gross Calorific Potential (PCS) in either MJ/kg or MJ/m2. Using the results of the above tests the total PCS for the product as a whole can be calculated. To achieve A2 performance the total PCS must be <3.0MJ.kg-1. Further to this, any non-substantial component, i.e. thickness <1mm, must have a PCS value <4.0MJ.m-2 and any substantial component, i.e. thickness >1mm, of a non-homogenous product must have a PCS value <3.0MJ.kg-1. This is important as many adhesives, such as those used for bonding stiffening angles to panels, will exceed this thickness and will not have a PCS value <3.0MJ.kg-1. In this case the product cannot achieve an A2 classification to EN 13501 and the best possible classification that can be achieved is a B (very limited contribution to fire). Solid metal with no mid span stiffening angle – will either be rated non-combustible, A1, if uncoated, or will typically be of limited combustibility, A2, if an organic coating such as a Polyester Powder Coating (PPC) is applied. Structural sealant / structural tape application – applying a sealant/tape would typically be in excess of 1mm and therefore the PCS must be <3.0MJ.kg-1. If the PCS is not less than this value the best possible classification that can be achieved is B, very limited contribution to fire. Welding (Arc, stud, etc) – a mechanical fixing method of attaching a rail to the rear of the panel that will not change the fire performance. It is however not suitable to a large number of metal substrates i.e. Zinc. It can also lead to heat distortion of the face at the weld line that may affect the surface finish of the final product. Mechanical fixing (Self-drilling screw, rivet) – a simple method to attach an angle that will not change the fire performance. The heads of the fixings will however be visible with this method and this may not be acceptable to an architect or client. Composite panels, such as aluminium honeycomb, must be tested by the manufacturer to confirm the performance of the product to EN 13501. 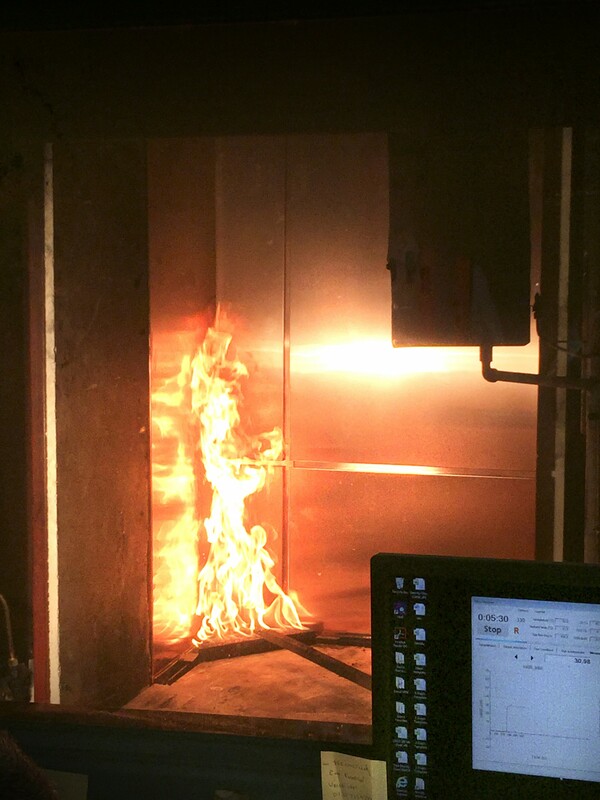 Limited combustibility, A2, classification can be achieved by these panels with many different facing materials including various metals (i.e. Aluminium, Steel, Zinc, Copper, etc) and back painted glass. We offer a number of rainscreen cladding solutions that have been tested to EN13501 and achieve an A2 fire rating. This includes Proteus GL, an integrated modular glass rainscreen cladding system that utilises a back painted glass facing. In addition, Proteus HR aluminium honeycomb core, structurally bonded between two thin gauges of lightweight metal skin has also been tested to EN13501 achieving A2-s1,d0 or A2-s2,d0 subject to metal finish. Proteus HR is lightweight, yet strong cladding panel, making it easy to install, and having ‘limited combustibility’ (A2), is an effective cladding solution for all buildings. It’s worth bearing in mind that as long as the cladding and all components used within the wall build up has a minimum EN 13501 certification of A2-s3,d2 it meets current building regulation requirements and there is no additional requirement for full scale BS 8414 testing to BR135 criteria. That is an important consideration because the BS 8414 test report is only valid for the exact construction and configuration of materials tested. Even minor deviations such as changing the cladding panel size or fixing method will require re-testing, which can run to tens’ of thousands of pounds. We have been able to achieve an A2 rating on Proteus HR and Proteus GL cladding systems because of significant investment in product design and development as well as our detailed understanding of EN 13501 testing and accreditation requirements. The straight forward message that we would give to installers is this; if you are choosing a cladding panel with a stiffening angle it will require considerable expenditure to have it tested and certified as achieving an EN 13501 A2 fire rating. A more efficient and cost effective route is to choose a cladding system that already has an A2 rating, for example, our Proteus HR and Proteus GL ranges.